Mark A. Schrumpf, M.D. is a board-certified orthopedic surgeon and a native of the Bay Area. He was born and raised in Marin County and attended college at Stanford, where he graduated with Honors. He attended medical school at the University of Southern California, where he was inducted into the Alpha Omega Alpha medical honors society. Dr. Schrumpf completed his orthopedic training at the world renowned Hospital for Special Surgery, where he focused his clinical and research efforts on reconstructive surgery of the upper extremity. His interests are in upper extremity fracture care, arthroscopic, reconstructive and replacement surgery of the shoulder and elbow. 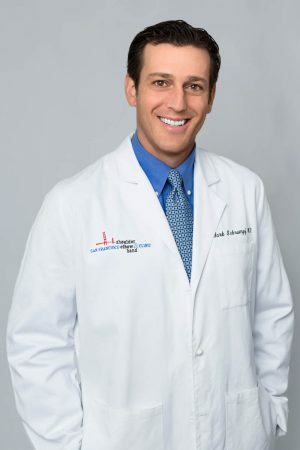 Dr. Schrumpf has served as a reviewer and published articles in for The Journal of Shoulder and Elbow Surgery, Clinical Orthopedics and Related Research, and The Journal of the Hospital for Special Surgery.